By Wesley McBratney – The Western Depot. 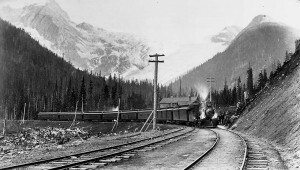 The Canadian Pacific Railway (CP) began in 1870 when British Columbia insisted upon a transport link to the East as a condition of joining the Confederation of Canada. At the same time, manufacturing interests needed access to raw materials and markets in Western Canada. The early history of CP is full of controversy, including the toppling of the Conservative government and forcing an election. 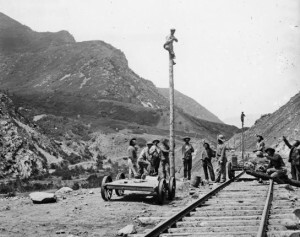 This caused a stall in the project, and construction did not begin until a group of Scottish Canadian businessmen formed a syndicate to build a transcontinental railway in 1880, nearly 10 years behind schedule. The railroad was incorporated in 1881, with George Stephen as its first president. That first year of construction was a complete bust with only 131 miles of track built. 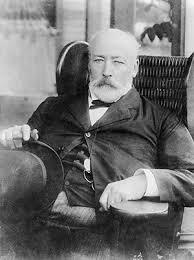 The chief engineer and general superintendent were fired and replaced by William Cornelius Van Horne. 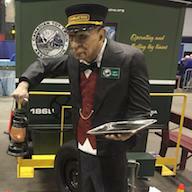 Van Horne boasted that he would build 500 miles of main line railway in his first year. Floods delayed the start of the 1882 construction season, but by the end of the year, Van Horne had laid 418 miles of main line and 110 miles of branch line. The Thunder Bay branch was completed in June 1882 by the Department of Railways and canals and turned over to CP in 1883, permitting all-Canadian lake and railway traffic from Eastern Canada to Winnipeg for the first time in Canada’s history. 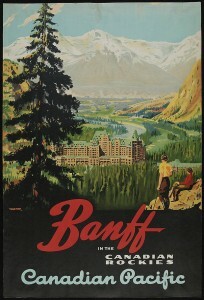 By the end of 1883, the railway had reached the Rocky Mountains. 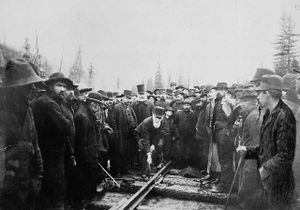 On November 7, 1885, the eastern and western portions of the Canadian Pacific Railway met at Craigellachie, British Columbia, where Donald A. Smith drove the last spike. 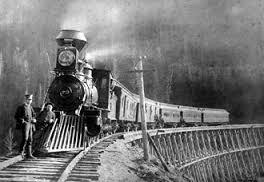 The first transcontinental train leaving Montreal and Toronto for Port Moody left on June 28, 1886, and arrived on July 4, 1886. This train consisted of two baggage cars, a mail car, a second class coach, two immigrant sleeps, two first-class coaches, two sleeping cars, and a diner. At around the same time, the western terminus had moved from Port Moody to Granville, which was later renamed Vancouver. By 1889, the railway extended from coast to coast and the enterprise had expanded to include a wide range of related and unrelated businesses. CP had been involved in land settlement and land sales as early as September 1881. They also erected telegraph lines along the transcontinental line, performed express shipping and built some of their own steam locomotives. 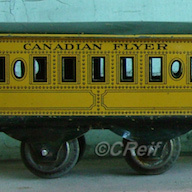 CP later built its own passenger cars, making it second to only the Pullman Company in passenger car production. CP also had steamships on the Great Lakes, chartered ships on the Pacific Ocean, and launched its own Pacific fleet in 1891. They were also involved in tourism and natural gas. At the same time as they were diversifying, CP was also expanding their rail holdings. CP leased the New Brunswick Railway in 1891 for 991 years, and built the International railway of Maine in 1889. In 1896 the decision was made to chart a second main line across British Columbia due to pressure from Great Northern and BC Rail. One result of these new lines in the West was that CP helped settle Western Canada as they ran an intense campaign to bring immigrants into Canada. Immigrants were sold a package that included passage on a CP ship, travel on a CP train, and land sold by the CP at $2.50 an acre requiring cultivation. During the First World War, CP put its entire resources at the disposal of the British Empire, including trains and tracks, ships, shops, hotels, telegraphs, and staff. As Canada entered the Great Depression, many railroads were strongly affected. However, because it was debt free at the time, CP was largely unscathed. One highlight of the 1930s was the Royal Tour of Canada, where CP and Canadian National pulled the Royal Trains across the country. Shortly after the Royal Tour, World War II broke out. As government energy and production geared toward World War II, CP put their entire network at the disposal of the war effort. 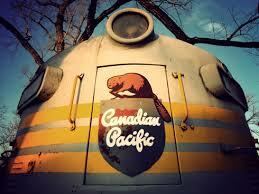 CP moved 307 million tons of freight, 86 million passengers, including 280,000 military personnel. They sent 22 ships to war, with only 10 returning, and they pioneered the “Atlantic Bridge”, which ferried bombers from Canada to Britain. After World War II, cars, trucks, and airplanes changed the landscape. Where rail was king, now cars, trucks, busses and airplanes took passenger and freight traffic away from the railways. CP was well situated to deal with this as they already had a hand in air and truck freight business. In the 1950s, CP was completely dieselized. In the 1960s started to pull out of passenger service, and in 1978, they transferred passenger service to VIA Rail. 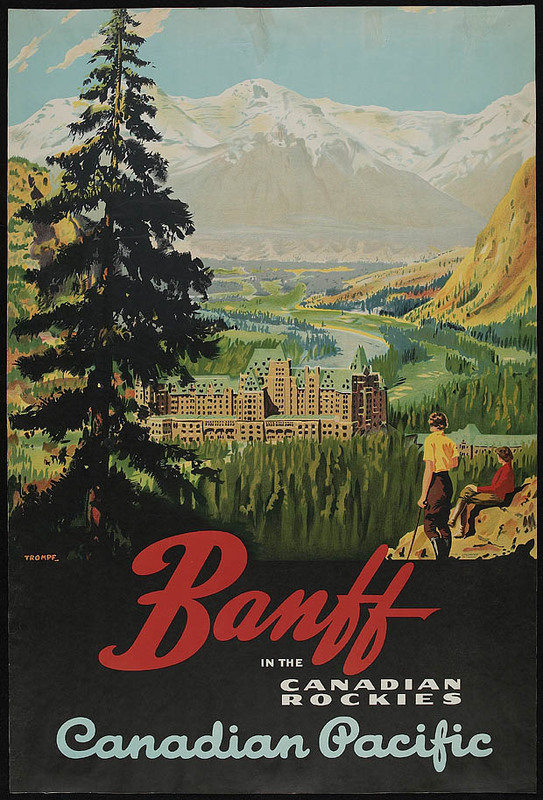 By 1986, CP was Canada’s second largest company with $15 billion in revenue, including their income from CP Railway, PanCanadian energy, Fordling Coal, CP (Fairmont) Hotels, and CP Ships. 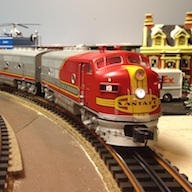 CP continued to grow with CP taking full control of the Soo Line in 1990 giving it access to the US Midwest. Soo had already absorbed Milwaukee Road and the Minneapolis, Northfield and Southern, in 1990. In 1991, CP bought Delaware and Hudson, giving it access to ports in the US Northeast. Currently, CP holds a 14,000 mile network extending from the Port of Vancouver to the Port of Montreal, including the US industrial centers of Chicago, Newark, Philadelphia, Washington DC, New York City, and Buffalo. Published with permission. 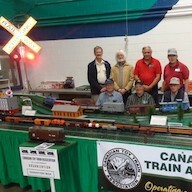 the CTTA thanks Wesley McBratney and The Western Depot. Berton, Pierre (2001) . The National Dream: The Great Railway, 1871-1881. Anchor Canada.